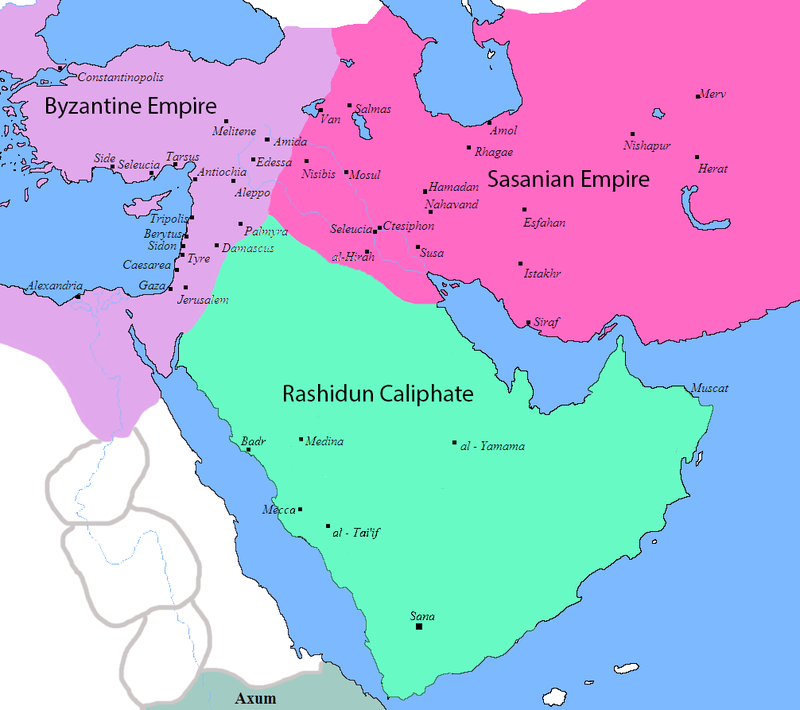 The Rashidun Caliphate had its inception with the advent of Islam. It was situated amidst two of the most formidable empires of the known world: The Byzantine Empire and The Sassanid Empire. But within 30 years,the Caliphate overwhelmed both the empires. The Byzantine Empire lost more than 60% of its territory to it. The Sassanid Empire was completely annexed, and the dynasty ended. In 635 Yazdgerd III sought alliance with Emperor Heraclius of the Eastern Roman Empire. Heraclius married his daughter (or, according to some traditions, his granddaughter) to Yazdegerd III, an old Roman tradition to show alliance. While Heraclius prepared for a major offence in the Levant, Yazdegerd, meanwhile, ordered the concentration of massive armies to pull back pull back the Muslims from Mesopotamia for good. The goal was well-coordinated attacks by both emperors, Heraclius in the Levant and Yazdegerd in Mesopotamia, to annihilate the power of their common enemy, Caliph Umar. While Heraclius launched his offensive in May 636, Yazdegerd was unable to muster his armies in time to provide the Byzantines with Persian support. Umar, allegedly aware of this alliance, capitalized on this failure: not wanting to risk a battle with two great powers simultaneously, he quickly moved to reinforce the Muslim army at Yarmouk to engage and defeat the Byzantines. Meanwhile, Umar ordered Saad to enter into peace negotiations with Yazdegerd III and invite him to Islam to prevent Persian forces from taking the field. Heraclius instructed his general Vahan not to engage in battle with the Muslims before receiving explicit orders; however, fearing more Arab reinforcements, Vahan attacked the Muslim army in the Battle of Yarmouk in August 636. Heraclius's Imperial army was routed. - Battle of al-Qādisiyyah effectively ending Sassanid rule west of Persia proper. This victory is largely regarded as a decisive turning point in Islam's growth: with the bulk of Persian forces defeated, Saad later conquered Babylon, Koosie, Bahrahsher and Madein. Ctesiphon, the Imperial capital of the Sassanid Empire, fell in March 637 after a siege of three months. Qa'qa sought permission for operating deeper into Persian land, i.e. mainland Iran, but caliph Umar didn't approve the proposal and wrote a historic letter to Saad saying: "I wish that between the Suwad and the Persian hills there were walls which would prevent them from getting to us, and prevent us from getting to them. The fertile Suwad is sufficient for us; and I prefer the safety of the Muslims to the spoils of war." After several years, Caliph Umar adopted a new offensive policy, preparing to launch a full-scale invasion of what remained of the Sassanid Empire. The Battle of Nihawand was one of the most decisive battles in Islamic history. The battle proved to be the key to Persia. After the devastating defeat at Nihawand, the last Sassanid emperor, Yazdgerd III, fled to different parts of Persia to raise a new army, with limited degrees of success. The battles won against Byzantines are even more numerous. I have typed these great lengths to exactly illustrate my point, the magnitude. Some victories can be called turn of situations, some talent of generals, some psychological victories. But, the magnitude of the phenomenon so large, it can't all be thrown to individual reasons. One significant reason maybe instability in Persia, but still the question stands. Such conquests, and attaining such largeness, takes long and long years of civilizational strides by nations, to have the economy to support, and mobilizing great manpower, or advances in weaponry, or innovative battle tactics, or producing brilliant generals, or strong fealties to the nation, or all of them. The Romans attained that in few hundred years, the Persians with centuries of continuous buildup, the Greeks, with years of growth of philosophy, the mongols, with centuries, before weaponizing their riding skills. So the question is: What disruption, or innovation, or disruptive innovation did the the advent of Islam bring, and render on the Arabs, that a nation of nomads went up and annihilated Great Empires, conquered great lengths of Earths in such short period of time (again, some 40 years), even just after emerging as a nation? And going on to win against deep rooted civilizations? Long lasting wars between Sassanians and Byzantine empire had made cripple armed forces of both of them and made their borders vulnerable. Lakhmids were acting as a buffer state between nomad Arabs and Persia. But Khosrow II made them into neutral force practically. the practice made Iran's southern border more vulnerable. Kavadh II massacred a lot of members of royal family, so it led to a internal crisis some years before Arab's invasion. 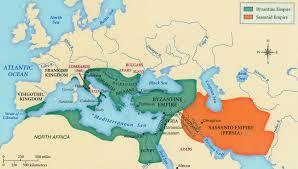 Remember, both Persia and Byzantium had wide borders in north and east and west with various enemies. They had to divide their troops along all the borders. Reference: *The Arab Conquest of Iran and its aftermath*: in Cambridge History of Iran, Vol 4, London, 1975. Byzantium and Persia were both greatly weakened by titanic wars they had fought with each other during the reign of Heraclius - at one point Byzantium was surrounded, and at another Heraclius was taking Persia's capital city. After the fall of Rome, the Byzantine Empire became the center of both political and religious power. The political and religious conflict between the Copts of Egypt and the rulers of Byzantium began when the patriarchate of Constantinople began to rival that of Alexandria. The Council of Chalcedon in 451 initiated the great schism that separated the Egyptian Church from Catholic Christendom. The schism had momentous consequences for the future of Christianity in the East and for Byzantine power. Ostensibly, the council was called to decide on the nature of Christ. If Christ were both God and man, had he two natures? The Arians had already been declared heretics for denying or minimizing the divinity of Christ; the opposite was to ignore or minimize his humanity. Coptic Christians were Monophysites who believed that after the incarnation Christ had but one nature with dual aspects. The council, however, declared that Christ had two natures and that he was equally human and equally divine. The Coptic Church refused to accept the council's decree and rejected the bishop sent to Egypt. Henceforth, the Coptic Church was in schism from the Catholic Church as represented by the Byzantine Empire and the Byzantine Church. For nearly two centuries, Monophysitism in Egypt became the symbol of national and religious resistance to Byzantium's political and religious authority. The Egyptian Church was severely persecuted by Byzantium. Churches were closed, and Coptic Christians were killed, tortured, and exiled in an effort to force the Egyptian Church to accept Byzantine orthodoxy. The Coptic Church continued to appoint its own patriarchs, refusing to accept those chosen by Constantinople and attempting to depose them. The break with Catholicism in the fifth century converted the Coptic Church to a national church with deeply rooted traditions that have remained unchanged to this day. By the seventh century, the religious persecutions and the growing pressure of taxation had engendered great hatred of the Byzantines. As a result, the Egyptians offered little resistance to the conquering armies of Islam. Many of the differences in outlook the Monophysites had with the home chuch were reflected in Islam, and Islam, at least at first, was less interested in how these schismatics wanted to worship than the persecuting church in Constantinople. And also, the simpler Islamic state required fewer taxes than they had to pay to Byzantium. So once the army was beaten, there was little resistance to further conquest by the Arabs, and as provinces fell the Byzantine and Persian states became weaker still. The critical factor all these answers leave out: The Black Death. The Plague of Justinian swept through the Byzantine and Sassanid Empires a few generations before Islam. On the Byzantine side, the reduction in manpower available for warfare was near 90%. The damage to the economies of both empires made it unlikely they'd rebuild the population losses quickly enough, and, as @user64617 pointed out, the two were frequently at war with each other anyway. As to where I get the "90% reduction" figure: Before the Plague, Justinian had sent Belisarius to conquer Italy. Belisarius frequently requested more troops, as cities came over to the Empire's side and he needed to garrison them. He'd request 10,000 -- and get 1,000. After the Plague, Belisarius was again sent to Italy, to fix some problems other generals had created and, if possible, continue the conquest. Again, he'd request 10,000 additional troops -- but this time, all he'd get would be 100. The political events between the two phases did not involve Justinian -- he was sick with the plague -- and his personal attitude towards Belisarius, and his intent to rebuild the Empire, had not changed. Sources: Belisarius, the Last Roman General by Ian Hughes; Justinian's Flea by William Rosen. The material superiority of both the empires had bled dry, in the disastrous war with each other 602-628 AD. This really was a big deal , as many helpful answers pointed out. Have a look at this. While not an academic source, it helps one get the scale of it. The war also ground down the Organisations and Institutions factor that I mentioned. The cumulative effect of these factors was, when they went into the conflict, the chances of Arabs prevailing were not as unlikely as it appears at the first glance. As the war progressed, the fortunes of war leaned on the side of the Arabs( from bad decisions in the field on part of Roman and Sassanid generals, commanders being killed in combat of champions, to strategic failure of not being able to co-ordinate the campaign). The empires, not vital and resilient enough to take it, and the factors mentioned lead to the spectacular result. Note - This is the OP writing the answer. I am submitting this as a community post, for the things I mentioned are not research backed theories, but mere postulates. I'd appreciate if the community helps shape these ideas and adds to them. Feel free to modify the answer if you think you can phrase things better, or chisel out the ideas in more detail. Not the answer you're looking for? Browse other questions tagged islam byzantine-empire persia arab caliphate or ask your own question. What caused Iranians to convert to Shiite Islam? Did Gandhi ever make a comment about Islam? Were commandos brought in to break the Grand Mosque siege French or Pakistani? What influence has Aristotle had on Islam?